MadCap Flare offers a robust, cost-effective alternative to traditional content management systems, giving you the ability to easily create, manage and publish content from a central user interface. MadCap Flare offers seamless integration via MadCap Central, a powerful cloud-based platform for content and project management, hosting, build automation, task tracking and more. You can learn more about MadCap Central here. Built-in support is also available for Microsoft® Visual SourceSafe®, Microsoft™ Team Foundation Server®, Perforce®, and Apache Subversion. Create or import content into the Flare file structure or repository. Easily publish content to multiple formats from a single content repository. Use what you need, for any given output, and store what you don’t. 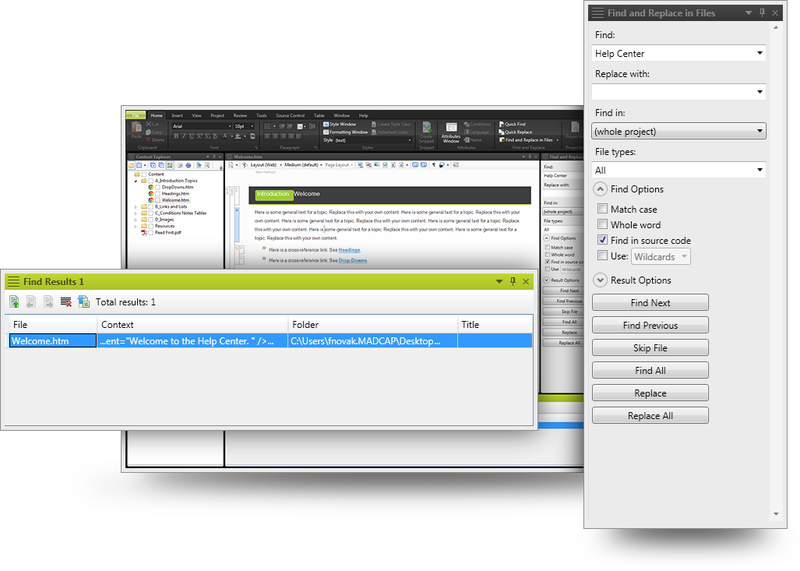 Flare allows for the streamlined creation of documents and outputs from component parts. For example, Flare enables users to assemble individual component topics into a map (document) structure using a TOC. These components can be reused (rather than copied and pasted) within another document or across multiple documents using other TOCs. This ensures that content is consistent across an entire documentation set and allows for maximum reuse. Advanced single sourcing features such as variables and condition tags are a tremendous time saver when managing and updating large amounts of content. Personalize content to specific brand guidelines or audiences – skins, TOCs, variables, snippets, variables in snippets, conditionality, glossaries, stylesheets, CSS mediums, snippet conditionalization, master pages and more. A streamlined approach to team collaboration, Flare provides workflows designed for efficient content development and management. Find content and files with search tools and metadata support for topics and outputs. Flare was built to support multi-language authoring, translation and publishing. 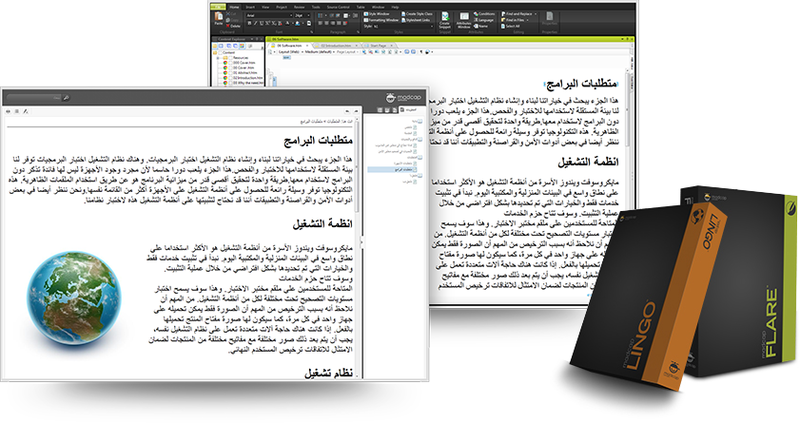 Flare supports Unicode language characters, double-byte Asian languages and Eastern European languages, as well as right-to-left language authoring and publishing including Hebrew, Arabic and Persian. Additionally, MadCap Lingo, a powerful CAT (Computer Assisted Translation) tool for streamlining the entire translation process, for translation management support and reporting. 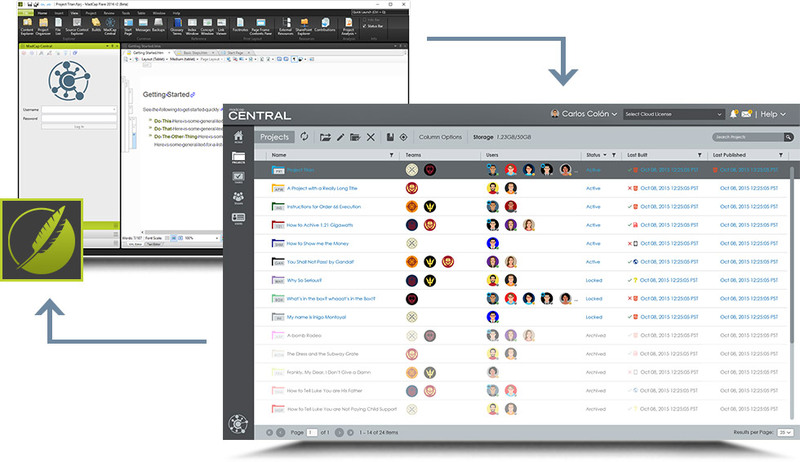 MadCap Central is a powerful cloud-based content management system that integrates with MadCap Flare, allowing you to easily create, manage and publish content from a central user interface. By combining MadCap Flare’s desktop-based content creation and authoring power with MadCap Central’s cloud-based project and task management, build automation and management, user permissions, team collaboration and more – you get the best of both worlds without sacrificing features, functionality or performance. You can learn more here.